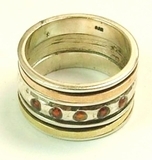 Rose gold & yellow gold combined with sterling silver and Garnets spinner rings. Directly from the source in Israel. 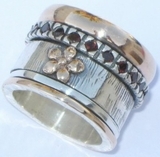 Sterling silver is a white, highly reflective precious metal. Gold is a remarkable, precious metal, with an unparalleled combination of chemical and physical properties.